I gave up on using the Marrakesh to make the Rivendell socks. Instead, I’m using Lotus Yarns Aura (it’s the one with the sparkly bits) in the Walking With the Ghost colorway. It’s perfect (thanks to the chickengoddess for the superb creative genius). And now that I’m done with those darned wraps at the top, it’s going very quickly. Just don’t look too hard at the heel; this is my first 3-needle sock, and somehow I forgot how to pick up stitches properly. It’s a perfect colorway and weight for this pattern. The pattern came from this month’s Knitty, and so far I love it. 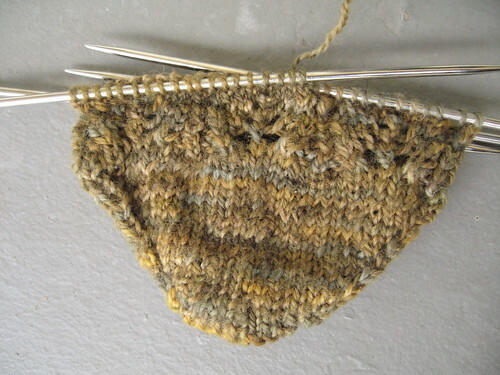 It’s a little more complicated than the last lace socks I knit, and I’m feeling satisfied with the new challenge. I’ll keep posting photos as I progress. I’m excited to see how the colorway continues to work with the leaves. In additional progress, I’ve picked up Super Secret project #2 again, and am surprised at how easy it was to do. I last knitted on it roughly three months ago (I think – it could have been more), and have found that I knew just where I needed to go next. I might have it finished in time to gift at Christmastime, if I’m very disciplined (and don’t cast on another four projects in the meantime, a thing that is likely to happen if I’m not careful). I find that knitting is like every other artistic pursuit for me – I can’t be satisfied unless I have many multiples of projects going at once. Though I don’t consider myself to be ADD usually, art is one place where I am definitely so. Knitting falls squarely into the art category for me. Alert to all you Atlanta knitters – Knitch is carrying Prym stainless steel dpns for the time being, in sizes 0, 00, 000, and 0000 (for this last size, I’m planning a pair of Renaissance period-accurate stockings, provided that I can find a pattern). I have bought one set in each size. You never know when you might need some more needles, especially with a sock project record like mine. I appear to only be limited by the number of sets of needles in my possession at any given time. And although I swore never to learn, today James gifted me a drop spindle and some roving and I am indeed learning to spin using it (I draw the line at a wheel, though – let’s do this in baby steps, if at all). I keep telling myself that I’m gearing up for tasty fiber at Maryland Sheep & Wool in May (yeah, right). I forsee a new sweater project coming up as soon as the weather cools off. I have the needles, so it could happen (but if I’m smart, it won’t). This entry was posted in General stuff, knitting and tagged fiber, knitting, socks, super secret. Bookmark the permalink. 3 Responses to I have knitting! 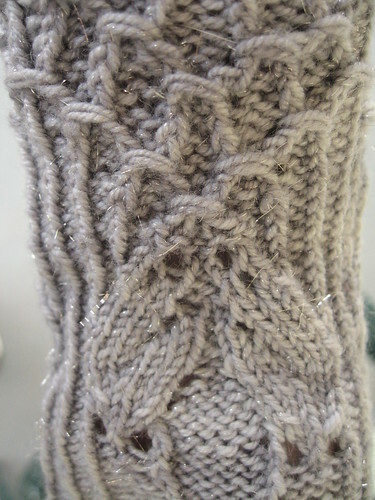 Oh my gosh, that gray piece is such beautiful knitting! You’re really good. ^__^ Cheers!